Only big companies win awards. 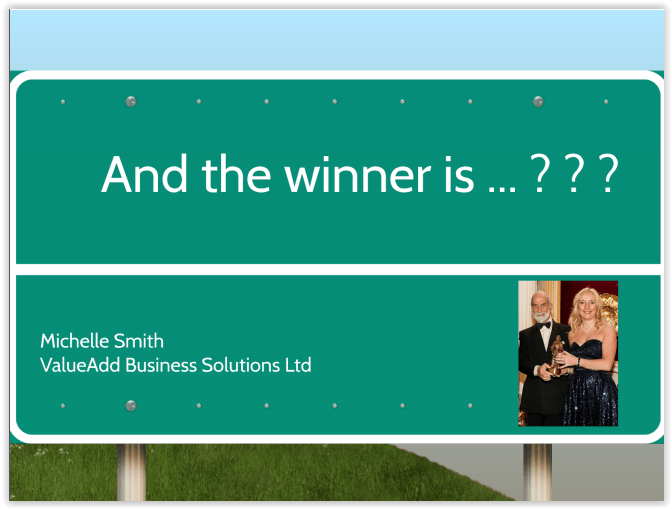 I can’t enter it into awards – what about confidential information? If I sponsor a category I’ll have a better chance. If I buy more seats at the awards dinner I’m more likely to win. Clients (new and existing). Associates, Potential Employees? What sort of awards would add value? What are the best stories? Innovation, Customer Care, Growth, Green/CSR. Find opportunities: Search, forums, coaches. 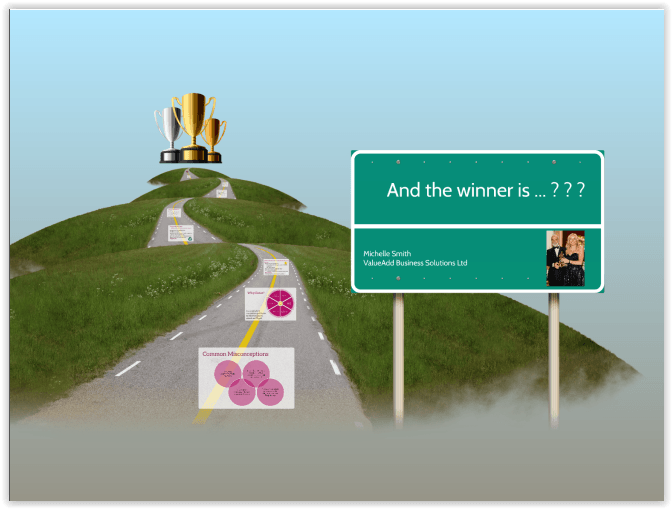 Entering awards provides a reality check on your business performance. The process is just as significant than the prize. 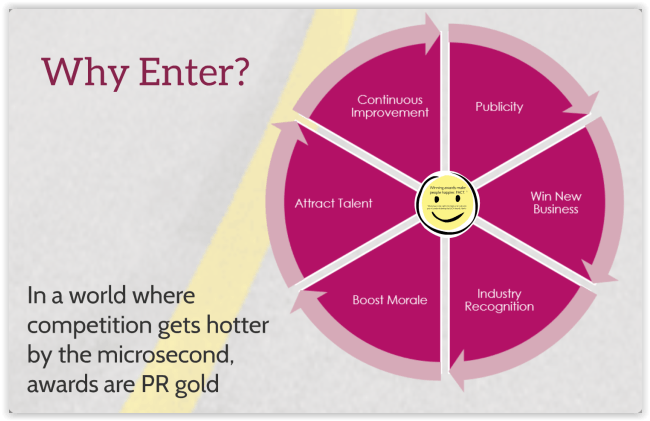 Winning starts with writing an above-average award application. Comply: read and reread criteria. Research: previous winners / gather supporting material / client endorsement. Write Persuasively: Don’t waffle or use jargon. Talk is cheap: Prove any claims you make about being the best, offering great service, value for money, being innovative etc. Be sure to answer all the questions the judges ask too, rather than just the ones that suit you to answer. Don’t copy. Be honest about what you are good at and how you can demonstrate this to the judges. You will be scored down if you don’t fulfill all the entry requirements. Start shouting as soon as you’ve been shortlisted (check with organiser when you can announce). Send out Press Releases to regional/trade press. Post articles in client and employee newsletters. Case Studies: Short for use in proposals / Mid-sized for marketing purposes. Including award logos in all customer facing communications (e.g. email footer). 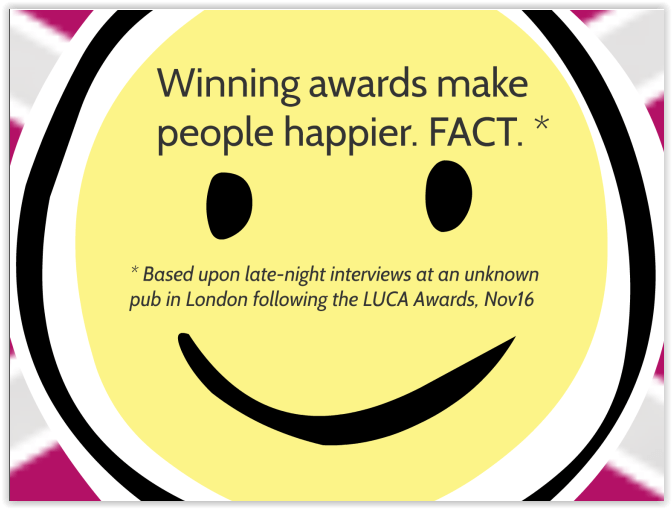 The day of the awards – use social media to build excitement. Attend any associated award social events. Pack your hand bag with business cards and schmooze at presentation ceremonies, cocktail parties and sit-down dinners. Swap business cards with the organisers and winners… you never know what relationships you might develop. Learn from the winner and other finalists. Chat in person or look at their marketing materials and website to see what they do that you don’t. 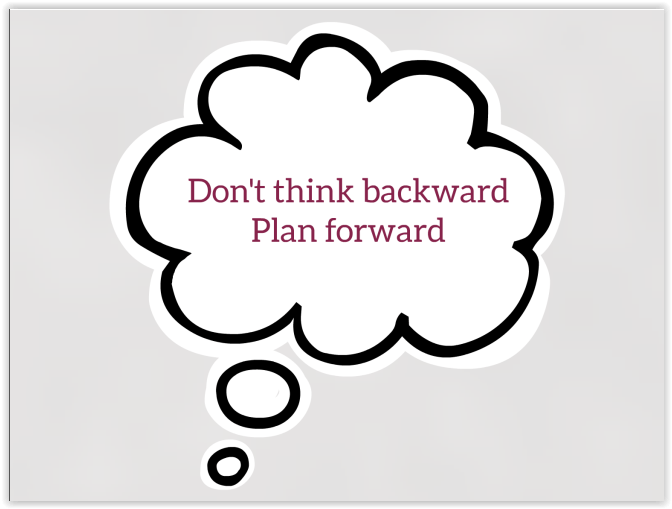 Awards selection criteria usually relate to core business, so revisit your business plan and fill any gaps. Have you addressed all of the evaluation criteria? Is your submission easy to read? Is your submission visually appealing? Evidence – can you provide hard metrics as proof? Any recycled content has been tailored for this award. Think about your last year in business – what have you done that makes you stand out? Maximise this… and remember YOU’VE GOT TO BE IN IT TO WIN IT.